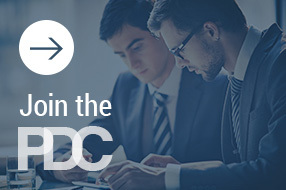 The Professional Development Consortium (PDC) is an association of individuals working at law firms, law schools, government agencies and corporations who are responsible for developing and administering training and continuing professional development for lawyers. In existence since 1990, this collegial group enjoys sharing ideas, strategies and best practices to improve the performance of lawyers and the profession. To guide outside providers to insure the development of training materials useful to in-house training and education. To view the PDC Bylaws, click here. The Professional Development Consortium (PDC) does not recommend or endorse, and disclaims all liability relating to, any particular service, discussion, opinions or other information presented or referred to on or through this Web site (including but not limited to the content of any advertisement), except for any statements specifically identified as expressing a policy or position officially approved by the PDC.